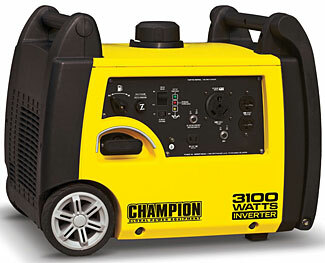 The Champion 3100W inverter/generator – currently our pick as best small inverter/generator for Level 1 type situations. When some people – particularly preppers – start thinking about generators, they immediately think of enormous noisy diesel standby generators, in special generator sheds, and capable of providing tens of kilowatts of power for extended periods, drawing off multi-hundred gallon storage tanks. Don’t get us wrong. We love diesel generators with a passion, and we also agree there’s no such thing as ‘too much’ power. But these types of installations will typically cost $10,000 and up, will guzzle gas at a rate of several gallons an hour, are definitely impractical for apartment dwellers, and frankly are overkill for the times when you have a short power outage lasting anywhere from a few hours to a few days. In these short time frames, we can compromise some of the convenience we normally enjoy with abundant and available power throughout our home, and also avoid needing to adjourn to our retreat to ride out the problem. All we want is a small convenient and ‘low profile’ portable generator that we can run without drawing way too much attention to ourselves, and keep the essential parts of our home operating. No matter if you have major industrial-grade generators or not, we suggest everyone should have one of these small generators – and here’s the key concept. Get a small one. Don’t ‘over-engineer’ the problem and end up buying something that generates enough power for you to have every appliance in your house all operating simultaneously. For a short outage, all you need is lighting, some essential electronics, and some power to share between your fridge and freezer at times, maybe a stove top or other cooking facility at other times, and perhaps heating or cooling at still other times. How Much Generating Power Do You Need? We repeat. Don’t over-engineer things. And note the question. We’re not asking how much power you want, or would like. We’re asking how much you need, in order to sustain life and a moderate level of comfort and security, for a short duration of no more than a few days. So, to sustain life, you need air, shelter, water and food, right? Let’s think about each of those. Air – hopefully you already have air! And hopefully also you can get fresh air without needing to drive some sort of fan or other motorized appliance. So presumably this does not need power. Shelter – a bit more complicated. We’re assuming that you’re in your regular residence and it is unharmed, so you have four walls and a roof already. But also part of shelter is some amount of heating or cooling. You know the seasonal weather extremes for where you live and you also know what you have installed in the form of hvac appliances. But perhaps for a short-term solution, you should not aim to heat/cool your entire residence, but work out a heating/cooling plan for just a couple of rooms only. Maybe you have a central hvac system, and in the winter you only need a small amount of power to drive the fan, with heat coming from natural gas. That would be ideal, and natural gas seems to continue flowing, no matter what happens to the power. But, even so, humor yourself next winter-time. Do a ‘what if’ worst case scenario test and see how many 1500 W heaters you would need to keep a central living area warm without your hvac. Hopefully you’ll be able to get by with only one. As for summer, again perhaps you have a central air system, but for the purposes of this exercise, can you also have a window unit that controls temperatures in just one room? A small generator is probably inadequate to handle the power needs of a central air system, but is probably suitable for a typical RV sized 13,500 – 15,000 BTU type unit. One other part of shelter – some lighting. Perhaps now is the time to start picking up LED lights when you see them on sale, so that you are getting maximum light for minimum watts. Indeed, the LED lighting is so good (and so long-lived) that there’s no reason not to use them all the time, in all your lights. So – heating, cooling, and lights. That’s pretty much everything you need for short-term shelter requirements, right? Maybe you have something else to also plan for, like a cellar sump pump? Try not to overlook anything else that might be essential. Water – do you have any water pumps (under your control, as opposed to operated by the building you live in)? If not, then hopefully (maybe) you’ll continue to get water from your taps during a power outage, and if you don’t, that’s a matter for another article. And what about waste water? Some people have macerator units on their toilets, or pumps operating their septic system, but other than that, most of us have gravity powered waste water systems (at least out of our house, beyond that, in the city system, there might be other issues, which are again outside the purview of an article about low powered home generators!). The only other consideration about water would be if you wanted warm/hot water. If you have gas water heating, maybe you have an electronic pilot light (although these are not so common on hot water heaters) in which case you need power for the hot water to work. Otherwise, if you have electric hot water heating, that will be a problem, because the elements in your water heater probably draw 5kW – 10kW of power, and that is more than you should reasonably expect from a small portable generator. There are two workarounds for that. The first is a small ‘under sink’ type water heater. The other is to simply heat up or boil water on your stove top. Worst case scenario, if you have to go without long hot baths/showers for a few days, that’s truly not the end of the world. Food – There are a couple of things to consider when it comes to food. The first is food storage – ie, your fridge and freezer. Ideally you want to keep these powered up, at least some of the time, so you don’t have all the food in your freezer spoil, and so you are able to maintain a cool temperature in your fridge too, besides which, depending on the nature of the power outage, you might need that food to live on. Find out how much power your fridge (and freezer, if separate) use when they’re running; we’ll tell you what to do with those numbers in a minute or two. The second part of food power needs is cooking your food. There are several ways you can prepare food using relatively small amounts of power. Your microwave is an efficient and effective way of preparing many food items. A small toaster oven is another choice, and a stand-alone hotplate/element is a third choice. You might also want an electric jug/kettle for boiling water for coffee and other purposes. Indeed, why limit yourself – get all these items (if you don’t have them already). None of them cost much more than $50 a piece at Costco or on Amazon. Make a note of the power requirements for such items. Everything Else – Okay, now we’ve covered the absolute essentials, but what else might also appear on a list of things you really need to be able to provide power to? We’d certainly agree that you need to have half a dozen watts on hand for your phone charger, and maybe a few more watts for a radio or even a television. For that matter, in the unlikely event that your internet connection is up, we’d not begrudge you the power cost of turning on your cable modem, Wi-Fi router and computer for an hour or two, a few times a day. Maybe you have some medical equipment you need to operate. And maybe you don’t want to have your generator running 24/7, and so have some batteries that you charge during the day and run your essential nighttime electrical circuits from at night. Now that you’ve made a list of all the items you need power for, you’ll see there’s probably nothing on the list that needs to be receiving power, every hour, every day. So this is where you now get to make a little bit of power go a long way. You do this by letting your appliances take turns at the power from your generator. For example, you know you’ll only need cooking appliances on a couple of times a day. You also know that your fridge and freezer can go quite well for an hour or so (fridge) or half a day or longer (freezer) at a time with no power (especially if you keep their door shut! ), and you also know that you can ‘play games’ with any heating or cooling, so that some of the day it is on, but some of the day it is not. So what you should do is arrange it that you either have a cooking appliance, a fridge or freezer, or some hvac equipment running, but never all of these items at the same time. How do you do that? Simple. Have plugs from all the devices sharing one (or two) sockets. That way you can only have one item plugged in at a time. Maybe you have some devices that would take up all the power, and three or four other devices that could run, any two at a time, and one or two devices that can be on or off at any time and it doesn’t really matter, because the power they draw is so low. What you’d do is you’d have the output from your generator going first to a power strip that has all the small power devices connected to it, and one remaining socket. You would have a collection of plugs next to this socket, and obviously only one of them can be plugged in at a time. You might have a plug for your a/c, and another plug going to something else, and then one more plug that goes to a second power strip, on which you’ve blocked out all but two of the sockets, and you have a collection of plugs alongside that, so that any two of them can be connected at the same time. That way it is physically impossible to overload your system, because the way you have your plugs and sockets lined up prevents that. You can – and should – also have a power meter in series with all of this to monitor the actual power draw (see below). Or perhaps manage all this with an Arduino based power management system. Most electric motors draw considerably more power when they are starting than when they are running at their normal speed. This surge or starting power draw can be two or three times their running power – in other words, a 1 kW motor might have a surge/start power demand of 2.5 kW. Some types of motors will draw as much as four, five or six times their normal running power while starting up. This surge/starting power can last for as little as half a second or as long as three or four seconds, and starts off at the very highest level and then steadily declines down to normal running power at the end of the startup phase. Most traditional generators will quote you two ratings – a rated or standard load, and a peak or maximum load. So if your theoretical motor, with its 1 kW normal power draw and its starting power requirement of 2.5kW was to be matched to a generator, you should get one with a rated or standard load of at least 1 kW and a peak or maximum load of at least 2.5 kW. But what say you have four devices, each of a 1 kW standard load and a 2.5 kW starting load? Does that mean you need a 4 kW generator that can handle a 10 kW peak? Happily, no. It is normal to assume that you’ll never have multiple devices all starting simultaneously. Because the starting load is so brief, and also quickly starts dropping down from maximum, this assumption is usually acceptable in most environments. So in this example, you’d want a 4 kW generator with a 5.5 kW max load rating. Our expectation is that you’ll end up with a power need in the order of about 3kW; maybe a bit less, and if it is much more than that, you’ve failed to correctly differentiate between ‘need’ and ‘would like’! The good news is that there are very many different models in this general power range to choose from. But that’s also the bad news. How to make a sensible buying decision with so many choices? Well, there are a few things to consider that will help steer you in the right direction. The first is that you want the generator motor to be four-stroke not two-stroke (ie separate oil and gas, rather than mixing the two together). Four stroke motors tend to be more fuel-efficient and more reliable. The second is that you want the generator to be as quiet as possible. Some generators publish ratings on how noisy they are, but unfortunately there’s no universal standard for how this should be measured. If you see a noise rating, it should be quoted in either dB, dBA, dBC, or possibly some other type of dB measurement. It would be helpful to know if it was measured at full load, half load, or idle (there can be more than a 10 dB difference between idle and full load), and at what distance from the generator the measurement was made. Was it in an open area or an enclosed room? Was it a hard concrete floor or something more sound absorbing? It is difficult to convert between the different type of decibel measurements, because the different weightings or adjustments that are implied by the letter A, B, C or D after the dB vary depending on the frequency of the sound being measured. As a rule of thumb, though, the same sound probably registers lowest on the dBA scale, and slightly low on the dBC scale, and higher on the plain dB scale. You’ll seldom/never see dBB or dBD. Oh, to add to the confusion, some suppliers sometimes use the term dB and dBA interchangeably, even though they are actually very different. You can sometimes get a sense for how loud generators are, even if they are not specified, by reading reviews on sites like Amazon. Chances are someone will compare any given generator’s sound level to another generator, and then you can start to work from there to understand at least the relative loudnesses, and if one of the generators does have a published sound rating, then you know if the other one is above or below that figure. A good generator has a sound level of under 60 dBA under at least half load when measured on a concrete floor from 7 meters (23 feet) away and with reflective walls 100 ft (30.4 meters) away, and with a very quiet ambient noise background (ie 45 dB). Another relevant issue is fuel economy and run time. These are two slightly different measures. Fuel economy can be thought of in terms of ‘how many kWh of energy will this generator give me per gallon of gas it burns’. An easy way to work that out is to see how many gallons of fuel an hour it burns, and at what load level. For example, a 4 kW generator, running at 50% load, and burning 0.4 gallons of fuel an hour is giving you (4 * 50%) 2 kWh of energy for each 0.4 gallon of fuel, ie, 5 kWh per gallon of fuel. The more kWh per gallon, the better. The run time issue is similar but different. It simply measures how long the generator will run on a single tank of gas. Sure, the more fuel-efficient the engine, the longer each gallon of gas will last, but probably the biggest factor in run time is simply the size of the gas tank on the generator. Run time means nothing when trying to get a feeling for gallons/hour of fuel use, unless you know how many gallons in the tank that are being consumed. In theory, you should turn the generator off when re-fueling, and even if you don’t do this, it is always an inconvenient hassle, and so the longer the run time per tank of fuel, the happier you’ll be. Make sure you understand, when looking at a run time claim, what the load factor on the generator is. Needless to say, all generators will run much longer at 25% load than at 100% load. One other nice feature, although one to be used with caution, is a 12V DC power outlet that might be suitable for some crude battery charging, depending on what its true output voltage might be. But be careful – charging batteries is a very tricky business and perhaps it is more sensible to charge the batteries through a charge controlling device, and from the generator’s 110V main output. An obvious consideration, but we mention it, just in case, is the generator’s size and weight. The smaller it is, the easier it is to store somewhere convenient, and the lighter it is, the easier it will be to deploy when you need it. Oh – do we need to state the obvious? Don’t run a generator inside. You must keep the motor exhaust well away from the air you breathe. Something that is often underlooked or obscured is the quality of the a/c power and its waveform. How close to a pure sine wave is the power that comes out of the generator? This doesn’t really matter for resistive loads like a heater, but for motors and electronic circuitry, the ‘cleaner’ the wave form the better. The only way to be certain about this is to connect the generator output up to an oscilloscope, but that’s not something that is easy for many of us to do. There is a new type of generator now becoming more prevalent which not only has an excellent pure sine wave form of a/c power, but offers a number of other benefits too. A typical generator (well, what we call a generator actually is a motor that runs an alternator) runs at a steady speed of 3600 rpm so that the power that comes out of the alternator will be automatically at 60 Hz (mains frequency). The a/c waveform will be a little bit rough and noisy, which can be a problem when powering more delicate electronics. Also, the engine is having to run at 3600 rpm, no matter if it is heavily loaded or very lightly loaded with power consuming devices because the frequency of the power generated is dependent on the speed of the motor. This makes the motor noisier than it needs to be, and at lower power loads, makes it less efficient because it is using a lot of power just to spin itself around. If the engine speed should fluctuate, so too will the frequency of the supplied power and that also can cause problems with electronic items. Modern high quality generators take a different approach. They generate a/c power at any frequency at all – it doesn’t matter what frequency, because they then convert the a/c power into DC power. Then, in a second stage, they use an electronic inverter to convert the DC power into (at least in theory) a very clean pure a/c sinusoidal wave form at 110V. You have a much nicer wave form, and because the generator can spin at any speed, the generator does not need to be so powered up if generating only a light load of power, making it typically quieter and more fuel-efficient (up to almost 50% more fuel-efficient). On the downside, inverter/generators are currently more expensive, and have slightly more complicated electronics. But for the type of application we are considering, they are usually vastly preferable. Some inverter generators have a nifty feature. You can double them up – if you connect the generator to another identical generator, using a special connecting cable that synchronizes the a/c output waveform of the two generators together, you can get twice the power. You might say that it is better to have two 2kW generators rather than one 4kW generator, because that way, you have redundancy. Anything could fail and you still have half your generating power. Another nice thing about most inverter/generators is that they have been designed, right from the get-go, to be small, compact, lightweight, and quiet. That’s not to say that they will be totally undetectable when operating, but they won’t be anything like as noisy as traditional generators that can be as loud as motor mowers, and if quiet operation is really important to you, some additional external baffling in the form of some sort of operating enclosure could drop the sound level down even further. Their compact size and generally light weight makes it practical for them to do double duty not just as an emergency generator that gets ceremonially wheeled out of the garage when the power goes off (or, even worse, that resides in its own special building), but also as a go anywhere/take anywhere general purpose generator, useful for outdoors events, camping, remote building sites, and so on. An obvious consideration for any generator is the cost. With the constantly changing mix of models, ratings, and prices, we’ll not get too specific other than to observe that at the time of writing, it seems you’re likely going to be writing out a check for a little less than $1000 for a good inverter/generator with about a 3 kW rating, which is about twice what you’d pay for a regular generator without the inverter stage. We expect this price differential to drop, but please don’t wait for that to happen before you get one! Here is Amazon’s current listing of gasoline fueled generators. Some are inverter/generators, others aren’t. Some are California emissions compliant (CARB), others aren’t. If we had to select a favorite, we’d probably nominate the Champion 3100W unit, or failing that, one or a doubled up pair of the Champion 2000W units. 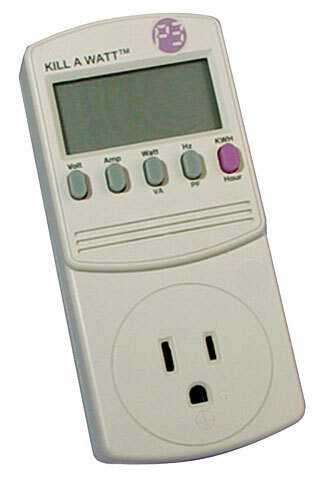 Devices such as this, costing $16 – $26, show you exactly how much power every one of your appliances consumes. It is normal for appliances to show their theoretical maximum power draw rather than their normal power draw on their labeling. While you need to leave a bit of ‘headroom’ to allow for occasionally one or another of your appliances peaking up higher to full power, it is acceptable to assume that most of the time, most of them will be using average rather than maximum power. So how do you work out how much power your appliances are really truly drawing? Easy. There are devices that you plug in between the appliance and the wall, and they measure the power consumption of whatever is plugged into them. Indeed, you don’t need to plug only one appliance into one of these measuring devices – we’ll sometimes plug a power strip into the measuring device, and then connect a bunch of equipment to it. As you can see, Amazon sell such units for as little as $16. Although there are some new low price units, we have always bought the only slightly more expensive Kill a Watt brand monitors. You only need to get one to be able to work your way around your house testing everything. In addition to showing you the instantaneous power usage, the Kill a Watt unit has another useful function – it can also show you total energy used over time. When would this be useful? Think of something that cycles on and off, such as your fridge. You can measure how much power it uses when it is on, and you can guesstimate how much extra power to allow for when it first starts up, but how much power does it use per day? Unless you stand over your fridge nonstop, day and night, carefully noting the minutes it is on and the minutes it is off, you’ll have no accurate way of knowing this. But with the Kill a Watt meter, you simply plug the fridge in, check it is zeroed, then come back in a day or two and note the total hours elapsed and the total kWh used. How easy is that! (Note that if you are doing these calculations, you should check for different total energy consumption rates based on hot and cold weather, on opening the fridge a lot or a little, on placing hot foodstuffs into the fridge, and so on. You’ll find that your daily average usage will vary enormously from some ‘good’ days to some not so good days. Your objective, much of the time, will be to run your generator at about 75% of full power. At power levels much above this, or at power levels much below 50%, your economy will start to suffer and you’ll be getting fewer kWh of electricity per gallon of gas. But how do you know how much power you are taking from the generator? Easy. Use the same Kill a Watt meter you used to calculate your power draws, and plug it into the generator then plug all power loads into a power strip plugged into the Kill a Watt. That will tell you exactly the power you use. You can use this information to know when you can add extra power loads to your generator, and when you are close to maxed out. Many cities and many landlords have restrictions on how much fuel you can store at your residence, and probably also on the types of containers you can store the fuel in. Sometimes these limits are per address, sometimes they are per building (which might mean you could keep fuel in a garden shed as well as in your garage and as well as in your house, too). Enforcement of such bylaws is typically done ‘after the fact’ – ie, if you have a fire and it becomes apparent you had a mega-fuel dump in your garage, then you may find yourself being asked some awkward questions, not only by the fire marshal, but quite likely by your insurance company, too. By the way, it is not always easy to tell, after a fire, exactly how much fuel was stored in each container, particularly if they were all in the one area. It is probably possible to see how many fuel cans you had, but harder to tell which ones were full, which were half full, and which had only a couple of pints in the bottom. It might pay to familiarize yourself with these requirements, and if you have a large number of half empty fuel containers, you better be sure you can explain why. That also points to another benefit of a fuel-efficient low powered inverter/generator. If you are trying not to trespass too far into ‘forbidden territory’ in terms of the fuel you store, then the more hours you can run your generator on a small amount of fuel, the better. Secondly, gasoline (and most other liquid fuels) has a surprisingly limited life. You can store it for three months with no ill effects, but after about six months, you’ll start to encounter problems. Our article about fuel storage tells you more about these issues and also recommends the best form of fuel life extending chemicals. We hate internal combustion powered equipment, and avoid it wherever we can, particularly for things we only use rarely. They can be difficult to store and unreliable in operation after extended storage. Electrically powered items are generally very much better. But in the case of a generator, you have no effective alternative to some sort of internal combustion powered device, and so you’ll need to be attentive to the manufacturer’s recommendations about periodic maintenance. Not quite so clearly stated is the need to also be sensitive to the age of your fuel and managing that, so you aren’t running old untreated fuel in your generator. Also not stated, but in our opinion very important, is to run your generator for several hours, perhaps once a quarter. Solstices and equinoxes are the trigger dates we use for all sorts of maintenance items (other people use daylight saving start/end dates for things that need maintaining less frequently). One other thought. It might be useful to keep a spray can of engine starter fluid as a way of helping your generator come to life if it has been too long since it last ran and it is proving reluctant to start, particularly on a cold day. Some generators start more readily than others. A small, lightweight, and almost silent emergency generator can allow you to keep power on in your normal home, even when the lights are out all around you. While we have nothing against larger systems that will power your entire home (and have one ourselves), if you’re not ready for a ‘full-on’ system and the costs and complications associated with it, a simple portable inverter/generator will give you enough power to make the difference between great discomfort and only moderate inconvenience. These small units are also invaluable for apartment dwellers. There are some “emergency” generators that are “dual fuel.” I recommend using ONLY propane gas. It will, to the best of my knowledge, NOT degrade over a long period of time. I’ve not seen any of the compact silent mini-generators out there that are dual fuel, but I’m sure they exist.